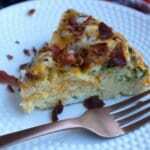 A savory and delicious breakfast casserole that is Keto and Low Carb Friendly. This Breakfast Casserole is made with eggs, cheese, spinach, and crispy bacon. Crack the eggs in to a large mixing bowl and add in the heavy whipping cream. Whisk eggs and cream together until smooth and well blended, then add in all other ingredients EXCEPT the bacon and 1 cup of cheese. Spray a 9x13 casserole dish or the equivalent size round casserole dish with nonstick cooking spray. Pour the breakfast casserole mixture into the casserole dish and bake at 350F for 30 minutes or until cooked through. While the casserole bakes, fry the bacon in a skillet until browned and crispy. Once the casserole is cooked, top it with the remaining 1 cup of cheese and place back in the oven just until the cheese melts. Top the casserole with the freshly cooked and crumbled bacon and serve with desired toppings.